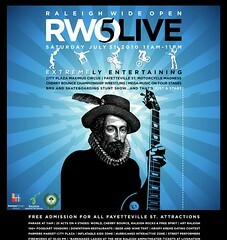 Raleigh Wide Open Returns to Fayetteville Street This Saturday! Raleigh’s annual festival along Fayetteville Street returns for a fifth time this Saturday. The celebration runs from 11am to 11pm with food vendors and entertainers the entire length of the strip. There will be music acts on several different stages, a beer tent, street performers and a great fireworks display to cap off the night. More than 75,000 people are expected to atttend! For more details check out the event website.